Nearest: Tube Station: Russell Square 105 yards (96 metres), Railway Station: London St Pancras Domestic 0.5 miles (0.8 km), DLR Station: Tower Gateway 2.4 miles (3.9 km), Motorway: M1 Junction 1 5.6 miles (9 km). Fantastic location for the tube system with no less than 5 Holiday Inn Bloomsbury is situated just off of Russell Square, which lies between the nightlife and attractions of the West End and the City of London where the main business institutions are based. Well served by transport links with Russell square station minutes away, many buses pass this central area and an abundance of Black taxis can be found around the Russell Square area. Coram Street is a relatively quite side street off of the busy Square. To the rear of the hotel is the Brunswick shopping centre, an open shopping mall with a good selection of shops and includes a cinema. Oxford Street which is probably the most popular and busy shopping areas for London visitors is just over half a mile away, while two more major tourist areas at Covent Garden and Soho are less than a mile from here. This a popular area for tourist class hotels being on the doorstep of central London but not in an area such as Mayfair where prices are hugely inflated. Nearby attractions include the British library (0.3 miles), British Museum (0.4 miles), Dickens House (0.4 miles), Sir John Soames Museum (0.6 miles), London Transport Museum (0.8 miles) and Leicester Square (1 mile). *Note: It's actually only a 15 minute walk from Kings Cross Station to the Hotel (less than half a mile) and you may prefer to walk straight to the Hotel if you know the area. The Holiday Inn Bloomsbury hotel offers modern accommodation and a range of amenities to ensure comfort and relaxation. In 2007 interior areas including lobby and Junction bar were refurbished giving the hotel a contemporary look and feel. All rooms have en-suite facilities, wireless high speed internet access, central heating with double glazed windows and feature interactive cable television with pay-movies and games. All rooms hav air-conditioning with cool/hot mode but please note the windows do not open. Other Amenities include built-in radio and alarm clock, direct-dial telephone, modem point, minibar, safe, coffee and tea making facilities, desk with lamp, trouser press, Separate Hanging Closet, hairdryer and power shower, complimentary toiletries and guest stationery. Irons and ironing boards and travel cots can be requested. Room service is available 24 hours. Room configurations include doubles, twins and deluxe rooms. The hotel provides facilities for disabled guests which include accessible bedrooms and one bedroom with a hoist. All rooms are subject to availability. Light meals, snacks, sandwiches and a fully licensed bar can be found in the modern styled Junction bar/lounge also on the ground floor. 36 different wines are served along with a selection of champagnes. In-room dining and 24 hour room service is available, and can be enjoyed in combination with Callaghans bar, an Irish style bar open Monday through to Sunday with live sports coverage. The Holiday Inn Bloomsbury provides concierge services, currency exchange, dry cleaning pickup and laundry service. The public areas are all air-conditioned. The front reception can provide safe deposit facilities. The state-of-the-art Academy Conference Centre has 15 air-conditioned suites, all with the latest in audio and visual equipment, that can cater for a wide variety of corporate and social gatherings. The largest room can accommodate up to 450 delegates reception style. Equipment includes 35mm Slide Projector, Cable Modem, DVD Player, Digital Projector, Flip Chart and Markers, LCD Projector, Lectern Microphone, Overhead Projector, Stage Lights, VCR and Whiteboard. Holiday Inn Regents Park Hotel: is 0.8 miles (1.2 km) away, has a guest satisfaction score of 81% and rates start from about £105. Holiday Inn Oxford Circus Hotel: is 1.2 miles (1.9 km) from here, earns a customer rating of 71% and base rates begin at about £104. Holiday Inn Mayfair Hotel: 1.3 miles (2.1 km), rated at 80% and with rates from around £160. Holiday Inn Camden Lock: 1.5 miles (2.4 km), rated at 89% and with rates from around £105. Another to Consider: A similar type of hotel (size, rating) nearby (0.2 miles, 0.3 km) would be the 4 star Mercure London Bloomsbury, with rates that start from about £103 and which has an 80% guest satisfaction rating. The Mercure London Bloomsbury also offers: free WiFi. We can also point you towards a lower price option, the Grange Portland Hotel. 0.3 miles from the Holiday Inn Bloomsbury (0.4 km), achieving a rating of 82% by its past clients with base rates starting at about £75. Can we suggest something with a higher guest score? We suggest the 5 Star The Principal London seems like a possible option. The Principal London is only 0.1 miles (0.1 km) away. The Principal London is one of the top rated London hotels with a 91% guest satisfaction rating. 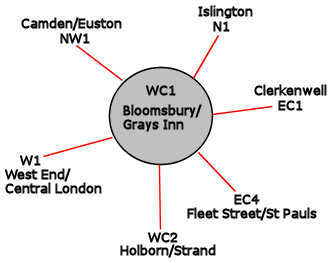 The closest fifty hotels around this area (Coram Street, WC1 postcode) that are listed on this website cover a 0.5 miles (0.8 km) radius. The numbers for each star rating are 3 five star hotels (average rating 87%), 20 four star hotels (average rating 82%), 17 three star hotels (average rating 77%), 8 two star hotels (average rating 71%) and 2 one star hotels (average rating 62%). The highest rating goes to Montague On The Gardens Hotel (4 star) at 99%. Base Rates: We look at what the average base rates are for the area and by star rating. These rates do not take account of offers and short term deals so are just a guide. If we look at the average for all hotels in the area (nearest 50) we get an average base rate of £100 per night. The lowest rates are at £16 at Generator Hotel (2 Star, 77%) and highest base rates of £222 at Renaissance St Pancras (5 Star, 89%). Averages for each sector of star rating: Five Star average: £173, Four Star average: £123, Three Star average: £85, Two Star average: £56 and One Star average: £53. We rank hotels based on our own proprietary algorithm based mainly on guest ratings but adjusted for influencing factors. We rank Holiday Inn Bloomsbury 21st (joint) of the 50 local hotels and 12th (joint) for the 20 four star hotels in the area. The hotel is 31st of 50 (8th of 20 four star hotels.) for lowest standard rates locally. Looking at the hotels rates plus its user rating we rank it 25th of 46 for sheer bang for buck (Generator Hotel was top). Best Disabled Access Award 2007. 2006 IHG Hotel of the Year.